Abstract: Real data are usually complex and contain various components. For example, face images have expressions and genders. Each component mainly reflects one aspect of data and provides information others do not have. Therefore, exploring the semantic information of multiple components as well as the diversity among them is of great benefit to understand data comprehensively and in-depth. However, this cannot be achieved by current nonnegative matrix factorization (NMF)-based methods, despite that NMF has shown remarkable competitiveness in learning parts-based representation of data. To overcome this limitation, we propose a novel multi-component nonnegative matrix factorization (MCNMF). Instead of seeking for only one representation of data, MCNMF learns multiple representations simultaneously, with the help of the Hilbert Schmidt Independence Criterion (HSIC) as a diversity term. HSIC explores the diverse information among the representations, where each representation corresponds to a component. By integrating the multiple representations, a more comprehensive representation is then established. 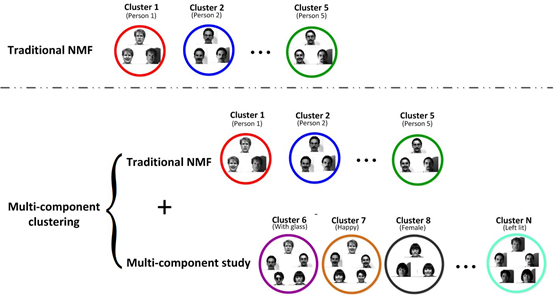 Extensive experimental results on real-world datasets have shown that MCNMF not only achieves more accurate performance over the state-of-the-arts using the aggregated representation, but also interprets data from different aspects with the multiple representations, which is beyond what current NMFs can offer.